2011 started off with a good friend, John Santistevan coming down from Denver to spring turkey hunt. It was the first time we had done a turkey hunt together in some time. It was a great time and I had forgotten how much fun it was to be out chasing gobblers in the spring. Our only archery hunters this year for antelope did not arrive until the first week of September. A group of five from Mississippi headed by Stephen Usry arrived to find very dry conditions (great for archery antelope). While the first few days started off slowly, the guys got serious after that and went 4 for 5 overall. Stephen Usry, Mark Duke, Jeremy Chrislip and Brian Reddock all connected. Stephen's and Mark's bucks should easily make pop and young scoring in the mid 70's. While west of Trinidad received good rainfall during the summer, east of Trinidad where the majority of my hunts take place was extremely dry. Some of the ranchers commented that it was probably the driest they remember! It changed patterns and moved many of the animals out of areas that we normally would see a lot in. Because of this our New Meixco elk season especially was very slow. Bill Byerly from Denver and Bill Wilcox from Wisconsin were our first elk hunters in New Mexico. Bill Byerly took a 6 x 6 but Bill Wilcox could not find one larger then he took in 2010 so he did not harvest. Bill is one of our favorite hunters and he and Vince Marrarotti (guide) obviously still had a great time. The second week of October saw John Corapi and Stephen Wilcox arrive for New Mexico elk. Neither shot bulls however a really nice 6 x 6 was located on the last day of the hunt but neither hunter could get within shooting range. Rifle antelope season in early October as always went well. Best bucks this year went to Kori Stauffacher and Marty Gottselig. Marty took a really heavy buck on the first morning and Kori (19 year old daughter of guide Stuart Stauffacher) was persistent and finally got the buck she had been chasing all week on the last morning of her hunt. While she had opportunities for other bucks that last day, she had decided she was going for him or none. After missing him earlier in the morning she finally connected about a half hour before they were to end their hunt and head for the airport. Her smile in the hunt photos says it all! 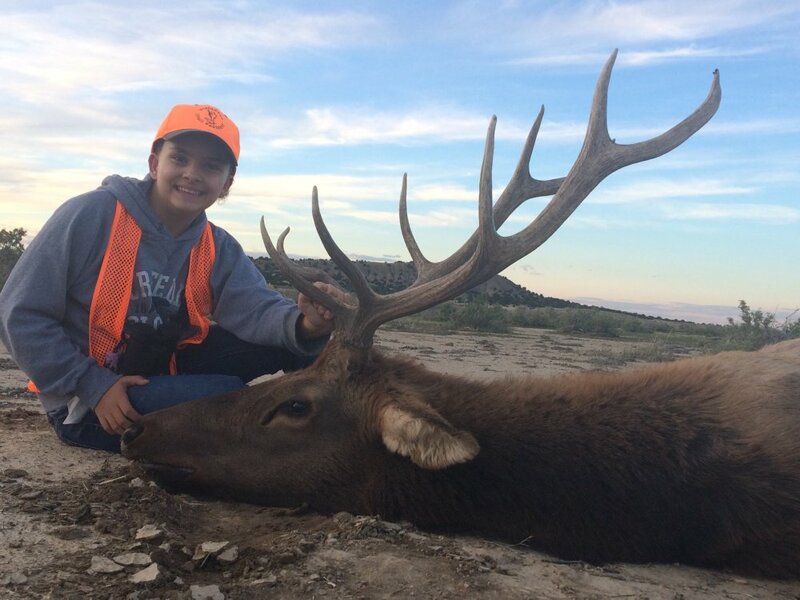 Kori's cousin, 15 year old Mathew Stauffacher hunted with his dad Ray as his guide looking for a really big buck. They finally found a really good buck towards the end of the week. The "Crazy Buck" we named him never allowed him to get a chance to get within range for a shot. Mathew also decided to hold out for him on the last day of his hunt. It turned out to be none; however I talked Mathew into hunting a hour the morning they needed to catch their flight back to Texas. Before the sun had broken the horizon we were taking photos of Mathew's first buck. Not the "Crazy Buck" but a great buck considering they were literally on their way to the airport with a short stop on the way. Lawerence Rearick again retuned for antelope and this year took the "Flat Horned Buck" that he had missed the previous year. Harold Hardin, Clay Adkison, Bill Byerly, Riki Tanaka and John Corapi all hunted antelope also looking for the legendary Ghost Buck. All took nice bucks but none saw him. We figured he was a meal for a pack of coyotes, but as happened for the past four years he again showed up after season. On my way to Trinidad from hunting camp while doing an elk hunt two days after antelope season ended, I spotted him 50 yards off the road! I called back to camp where John Corapi and Stephen Wilcox were hunting elk and told them to come and see him so my story would have some credibility and they verified his existence. Where he goes or what he does is beyond me. He really is the "Ghost Buck". Our first rifile elk hunt in Colorado was mid October. Lisa Smith from Tennessee came out accompanied by husband Terry. Their hunt was action packed from the get go and Lisa took a nice 7 x 8 on the second day. It could not have happened to a nicer lady. My daughters Chrisily and Kami gave her a lucky necklace before the hunt which she was wearing when she bagged her first elk. They also were excited to show her the three tarantulas they caught on the road while we were driving to hunting camp to see her bull. Lisa did not seem as excited as my girls when she opened the small igloo cooler we had them stored in. Late October had Michael Taylor and Ed Landry in camp hunting deer and Randy Hasten and Ron Schump hunting elk. Michael took a really nice 3 x 3 muley but Ed was not successful in getting the nice 4 x 4 they were after most of the week. The same bad luck met with Randy and Ron. Randy missed a really nice bull on a far shot early in hunt and was never able to again get close to a good bull. Ron was along with Randy to take a cow but was waiting for him to shoot his bull first. One day 9 cows ventured about 100 yards from Ron however his rifle was at the truck as he was waiting for Randy to shoot first. Ron, you could have used Randy's rifle. The last hunt of the year was at a new ranch where both Lawrence Rearick and Harold Hardin were to mule deer hunt. Vince Massarotti, ranch owner Tom Usry and I teamed up to hunt with them. Tom said it was also a very slow year on his ranch because of the extreme drought. We saw a few small deer the first couple days but nothing to shoot. Harold had an elk tag in his pocket also as he was supposed to go from there to another hunt. Tom said if he saw a good bull he was welcome to take it in place of the buck. Guess what we saw the second evening! It was too good a situation not to take advantage of so Harold's deer hunt ended up with a 6 x 6 elk instead. Lawerence did take a really nice 4 x 4 buck later in the week. Way to stay with it Lawerence. This year Herman Meyer and Rayond Dollins hunted River Canyon Ranch east of Trinidad for mule deer. Thinking this was going to be a good hunt in spite of the drought because it had irrigated fields and lots of river bottom country with the Purgatorie River flowing throught it, we were excited about finding a "Big Buck." After a few days and lots and lots of mule deer bucks looked over, we had nt seen a really good one. We did however locate two really big whitetails. After a little persuasion from me and Raymond's guide, Mike Ballew, we convinced Hermon and Raymond to try for these. About 10 minutes before last shooting light, Herman shooting first and Raymond shooting next, dropped the two bucks 50 yards apart. Herman's gross scored 174 and Raymond's gross scored 164. Not too bad for their Colorado mule deer hunt! I thought this was a fitting end to my 2012 season. Then in late November, a last minute hunt came together on the Hill Ranch with John Corapi. We hunted the third week of December again as we had last year. I had spotted a really nice muley in September while guiding there for elk, however the public hunter in late November took this buck. According to ranch manager, Mike Powell, he grosses almost 210. Mike Powell did however say the public hunter saw a "bigger" buck once but necer could get a shot at him. Mke gave us the general location this buck had been seen ao we decided to focus our hunt there. Two years previous a photo of a giant buck taken from a helicopter doing game counts on the ranch (winter of 2009-2010) was sent to me. No one had ever seen rhis buck except for that one time. It's always nice to think that maybe just maybe this could be him. I printed a copy of this photo and showed it to John before the hunt began. By the fourth day we had not seen anything big but decided to stay the course. It snowed most of the 4th day of the hunt and morning of the 8th saw perfect conditions with a foot of fresh powder. We spotted lots of deer throughout the morning but not anything John wanted. Then about 1:00 PM we spotted a buck moving through the trees on an opposite slope. After a few minutes we finally got a good enough look at him to decide that he was a really good buck to shoot. He was aslo in the area where the other hunter seen the "bigger buck." He was moving side hill across the slope and we had to scramble and get a head of him across the canyon. Finally after getting set up he stopped in an opening and John got a shot. When we walked up on him my first comment to John was "this is him". John Replied "the buck that the public hunter saw?" "Probably," I said but I mean "this is him." "Oh you mean him," John said. "Yes, I mean him," I said back. He gross scores 222 and is probably 9 to 11 years old. He is probably 20 to 30 inches smaller than when the photo of him was taken from the chopper, most likey because of his age. He is still magnificent. In two years on the ranch, John has taken a 197 and a 222. That's an average of almost 210! As I type this summary I am thankful for given the opportunity to share in such a great experiences and to have made so many great friends. Thanks to all my guides, Vince Massarotti, Dan Bickman, Jim Bickman, Stuart Staffacher, Henry Santistevan, George Toress, Gary Hill and Clint Hill. I would not be able to share these memories without your assistance and dedication. Thank you also to cooks Kathy Roberts and Tish Saccomanno. Most hunters go home weighing more than when they came. If you are interested in hunts for next year, contact me on what is availabe as soon as you can.